Liffey Cycle Route – Option 7 now on the cards! Tomorrow morning I will attend a meeting of the City Council’s Transportation Strategic Policy Committee. A key item on the agenda is the proposed Liffey Cycle Route and the emergence of new option that would see a continuous Cycle Route being provided along the North Quays. Since this project was first mooted some five or six years ago, I have been supportive in principle but have always said that until detailed design works was provided, I would reserve final judgement. In advance of the meeting tomorrow, I have now reviewed the report detailing Option 7. I’m not happy! Why? Engineers are proposing that no private vehicular traffic will be allowed up the North Quays from Blackhall Place to Arran Street and only limited non public transport vehicles between Arran Street and the Church Street junction. 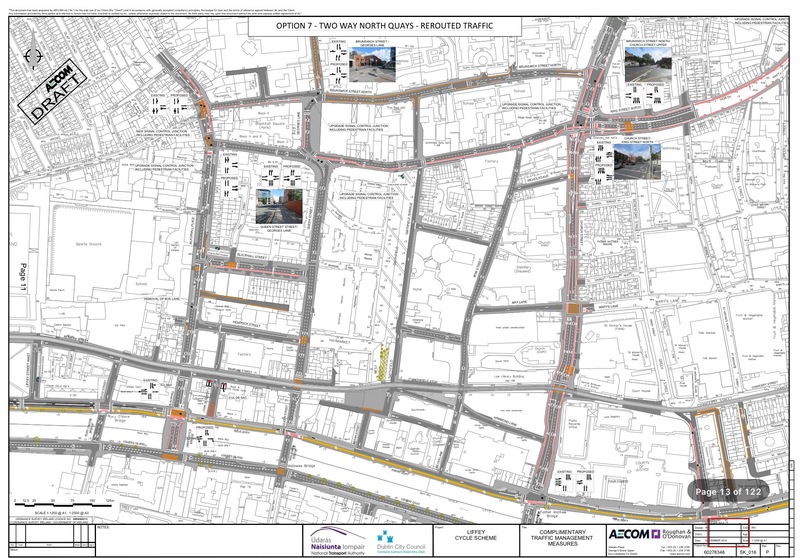 From the details provided in the two and a half page report, no consideration has been given to how the added volumes of traffic will impact upon the existing residential communities in Stoneybatter and Church Street. Furthermore the report only talks about the traffic being rerouted along North Brunswick Street but ignores the likely reality that Manor Street, Prussia Street, the North Circular Road, Bolton Street and Dorset Street will increased volumes of traffic. This will be in addition to the already large volumes using these streets which already resemble car parks in morning and evening rush hour. What consideration has been given to how the proposed rerouting of traffic will impact Stoneybatter, Church Street and other local residential neighbourhoods? What is the likely figure of extra vehicles that will be rerouted to roads like Blackhall Place, North Brunswick Street, etc? What impact assessment has been carried out as part of the compilation of this report into how already extremely busy streets will be affected? Has a road safety assessment been carried out on these streets, especially in light of the increased road fatalities and accidents that have occurred on Dublin roads in 2016? What engagement has been had with the local community, residential or business in the area as part of the compilation this report? Following tomorrow morning’s meeting, I will share a further detailed report including answers to the questions I put and indeed and other information which might be of use. If you have any questions or queries about the specifics of this proposal, please make sure to email me at raymcadam@gmail.com. This entry was posted in Church Street, Dublin City Council, Grangegorman, Montpelier, North Circular Road, Phibsborough, Quays, Smithfield, Stoneybatter. Bookmark the permalink.